Meal Planning with E-Mealz plus 3 Months of E-Mealz Giveaway! I’ve been telling you for the last couple of years now how important meal planning is. It’s really the best way to create a budget and save money when it comes to cooking. When I was first getting started, I don’t always have the time to plan out and fix a healthy, balanced meal each night of the week. After searching for and trying several different meal planning ideas, I finally came across E-mealz. I used E-mealz faithfully for about 6 months. It saved me so much time and money in planning out each week’s meals, and helped reduce the stress of meal planning. Plus, it got me back in the kitchen. And our family is back together at the dinner table, instead of spending lots of money eating out all the time! 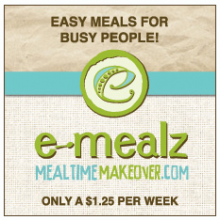 E-mealz has so many different meal plans to choose from. We subscribed to the low fat specialty meal plan. At only $1.25 week, my meals and grocery shopping were planned for me. I use E-mealz as a starting guide, then add my own twist to many of their already delicious recipes. With so many weekly meal plans to choose from, I’m sure anyone could find a plan that would fit their family. They even have plans that are specific to grocery stores and superstores sales with an aisle-by aisle grocery list! It’s been so easy to print the list, match up my coupons, and go! Plus they have a have a great Blog that you can get additional tips and recipes from. I’ve passed this on to many of my friends and they love it. Especially my stay-at-home moms and dads! At only $5 a month you can try E-mealz for yourself, or even give a plan as a gift to someone. Now through January 15th FrugalDay readers can get 10% off a subscription with code “2012” at checkout! Follow @EMealz on Twitter then â€œTweetâ€ I would love to try the _____ meal plan from E-Mealz. Check out E-Mealz on Facebook and “Like” your favorite post. Make sure you leave a comment letting me know you’ve one one or all of these to enter to win! Please use a valid email address, this is how I will contact the winners. Winners will have 24 hours to claim their prize. Giveaway will end at 8:00pm PT on Wednesday, January 11th. One winner will be chosen randomly using â€œAnd the Winner Is:â€ a WordPress plug in. Good Luck! Open to US residence only. Menu Planning by Relish only $16. Why you should grab this deal! Don’t forget to head over to FrugalDay.com to enter to win! This is such a great giveaway, you’ll love it! I loved the post about organizing. Especially the yarns in a box. So cute! all signed up for the giveaways. looks very interesting. I may have to try this.